SimCity is one of my favorite computer game franchises from my childhood. I began playing SimCity 2000 when it required writing bootup batch scripts to allocate 4 megs of memory in MSDOS circa 1995. 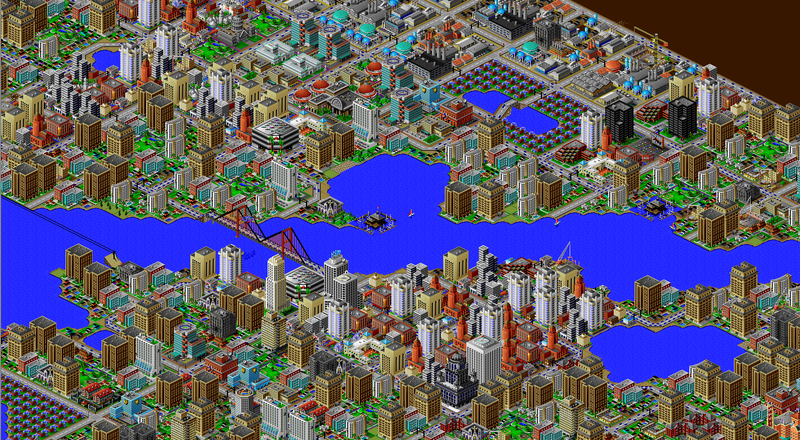 The sequels SimCity 3000 and SimCity 4 were part and parcel of my gaming repertoire though much of my adolescence and inevitably shaped my current interests in computing and data analysis. As such, I eagerly await the release of the newest version, simply titled SimCity, this week so I can try to build a version of utopia then try to break it. However, this latest version of SimCity is being released in a social and political context mangled by ideological strife that threatens to appropriate my nostalgia and excitement for a computer game to abet the interests of an extremist political agenda. Case in point, SimCity has already been invoked during the 2012 Republican presidential primary campaign (H/T Grant Edgett). And for this, I will not stand. tl;dr: Pundits won’t be able to resist using SimCity as an empirical justification for right-wing policies when one has nothing to do with the other. SimCity was first released in 1987 by Will Wright and is based on the urban planning theories of Jay Forrester . It puts players in the combined positions of mayor, urban planner, and god to manage a simulated city’s development through ordinances and fiscal policy, design expansions through zoning and transportation, and instigate natural disasters like earthquakes and UFO attacks. Wright was interviewed recently by the current lead designer of the new game and he talked about the importance of fiscal discipline, a word of course topical to a city simulator, but also substantially more fraught in the current political context. With unemployment high, economic growth faltering, tax revenues plummeting, and pollution rising, political leaders are facing tough decisions about how to put the economy back on track by cutting services and raising revenue while also responding to complex challenges and investing in new initiatives. But first the hurricanes and meteor strikes have to be attended to. This was the ripped-from-the-headlines scenario I faced as mayor of Centeropolis in the most recent release of city-building simulator SimCity. The game lets players lay out their city from scratch and manage its growth and budget by setting up zoning, erecting schools, setting tax rates and enacting ordinances, and managing traffic through road construction and mass transportation. All without the messy details of having to file cloture, attend fundraisers, win elections, worry about elections in Italy, or simultaneously appease lobbyists and people in tri-corner hats. Amidst the failure of either side budge or offer a compromise and in the absence of real leadership like Tip O’Neill and Ronald Reagan, SimCity’s sandbox offers a third way for us to evaluate how we could address the most serious problems facing our country today: the debt. How much in the way of services can we cut before the seams of society come loose? How much can be raised in revenue before citizens revolt? And is there a centrist and reasonable “Sim-Simpson and Bowles Commission” solution in between these extremes that Republicans and Democrats are committed to that could serve as a model going forward? Sparing you the arcane and geeky details of how these simulations were setup or run, my research assistants recreated a region called Centeropolis consisting of several interconnected cities reflecting our modern, diversified economy in the midst of economic turmoil that possesses our country with low growth, poor healthcare, rampant unemployment, odious inequality, overworked institutions, decaying infrastructure, and most importantly of all, high debt. Because the government’s budget is just like a household’s, we sought to solve the debt problem as quickly as possible since that would then solve all the other problems. The results of our simulation are striking. Implementing the Democratic plan of maxing out taxes and regulations while cutting security resulted in a Detroit-like wasteland of over-entitled and under-employed moocher SimCitizens. While some of the Republicans’ positions such as dissolving the Department of Education and requiring transvaginal ultrasounds for birth control are known for being too extreme, we adopted a mix of both sides’ approaches. Cutting ordinances regulating businesses and lowering punitive taxes while showering subsidies on well-connected industries attracted new business while cutting expensive services such as healthcare and education greatly saved on costs in Centeropolis. Although secondary problems arose like life expectancy decreasing, pollution levels increasing, and research activity departing, we were able to solve the debt problem quickly. While this is not a perfect model because the other problems were not solved, it suggests that politicians should perhaps spend more time translating this obviously common sense SimCity scenario into common sense real world legislation. Is it too much to ask that our politicians respond to our real world crises the same way any of us would respond to the same SimCity crises? While it’s obviously a caricature, I’m so confident of the appeal that “SimCity Authoritarian Technocrat Simulator as Panacea to Political Dysfunction” will have to pundits everywhere that I’m writing the rest of this blog post simply as a pre-emptive response. In fact, I’m so confident of the appeal of this framing to these usual suspects, I’ll donate $5 to Doctors without Borders every time it appears in a major outlet. Needless to say, this framing has a number of serious fallacies and flaws which should raise the heckles of responsible policymakers, pundits, and citizens. “Why do you care about this, Brian?” Well, it’s a disservice to games, a disservice to our democratic process, conflates the simulated with the real, and is incredibly elitist. 1. Expertise fallacy, or pundits pretending to have played the game. There is no way David Brooks, Thomas Friedman, or the rest of their ilk on the Aspen-Davos circuit would ever condescend to invest the time in playing a game like SimCity when there are panels, boards, and junkets that need their well-remunerated attention. There is something fundamentally offensive about elites entering the magic circle and appropriating a sandbox game that revels in the details of encouraging experimentation and testing boundary conditions of a software simulation to instead make pronouncements about the validity of their worldview of the week. To these elites, demystification, deconstruction, and investigation of how systems operate should be their domain, not something that rubes like you should be allowed to participate in as well by playing out your own simulations. These new computational literacies also contrast the innumeracy of our pundit class who reject indeterminism inherent to simulation: they are confounded if not outright hostile to people like Nate Silver doing “complex” analyses such using weighted averages of polls for forecasting with uncertainty if the results contradict their data-free pronouncements. Similarly, they are alternatively hostile to or scared of games like Grand Theft Auto that permit players the agency to construct narratives beyond the control of culture-makers like directors and writers who are elites like them. Pundits thus will feign numeracy and gain the cover of objectivity and relevance by “running the numbers” for you in playing out the simulation and report the findings produced by the infallible, objective computer that coincidentally reflect their preferences instead of encouraging you to explore the universes of alternatives. 3. Mapping fallacy, or believing policy choices within a game or simulation are appropriate or realistic for real world. Just because a SimCity can be built relying entirely on mass transportation and clean energy doesn’t mean that its real world analogue would operate with anything like the same efficiency or efficacy. While simulations can be accurate, games need not be reflections of the real world and truths produced by complex machines need not be true: any simulation merely tells you what the programmers told it to tell you. Simulations can be valuable tools for promoting the understanding between complex relationships, but these relationships remain fundamentally influenced by the values and choices of the designers, not the world at large. Agent-based models like SimCity and related abductive approaches to inference absolutely have their place in the methodological toolbelt of computational social scientists and policymakers, but unless you’ve thought critically about the validity of mapping affordances of computed-mediated contexts to the offline world [1,2], leave the games to the gamers and the policy to the policymakers. 4. Abstraction fallacy. Believing that citizens are simply automatons following simple rules that result in predictable and manageable behaviors. This is a distinct type of elitism from that which I outlined under “Expertise Fallacy” because it seeks not to simplify the process of interpreting and understanding a simulation to preserve ideological dominance, but because it constructs the members of the system as abstractions in some other place lacking any autonomy and governed solely by simple rules unlike humans who are diverse, beautiful, unpredictable, and affected by policy choices. Previous versions of SimCity elided the importance of race, irrationality, or sociality when creating a simulation of the material dimensions of city life : the citizens of SimCity do as their code tells them and mostly have no say in what happens to them or their city which works out well for aspiring despots like the player. The pundits’ proffered policies under the guise of validation-via-simulation will not happen to abstract automatons, they will affect a friend’s job or a parent’s healthcare. If there is any value to be gleaned from these inevitable UFOs, it will in the process of abstraction in the other direction and the possibilities these games offer to permit a “reconquest of a sense of place” . These simulations reveal the systemic logic and large and interrelated chains of cause and effect so that familiar places are not seen in isolation but as a confluence of historical, geographic, economic, social, and political choices and relationships that we collectively have the power to influence. It is absolutely the prerogative of every SimCity player construct a utopian fantasy or reduce her city to rubble because it is a game, not a macro-economic simulator of policy choices facing this nation. SimCity invites players to participate in the deconstruction of the game so that its rules and mechanisms become transparent and demystified. Pundits who will write these columns extolling the virtues of SimCity for rational technocratic governance will be misrepresenting the purpose of the game, oversimplifying the social, economic, and political choices we face, and most egregiously, misusing their position which could reveal and demystify the forces arranged to undermine our institutions to extol the virtues of what the designers themselves call a “toy.” In so doing, they not only reveal their own policy preferences which inevitably serve to benefit elites like them, but they will also provide ideological cover for partisan extremists intractably opposed to reforms and policies most Americans support. The stakes of how we respond to the hostage-taking political processes that brought us the sequester and fiscal debacles are far too high: real people will be losing their livelihoods and lives so that Congressional teahadists can play out their small government fantasies. Instead of using their privileged position to hold these zealots and their failed policies to account, these pundits will be offering the thin gruel that a simulation like SimCity offers some tincture for what ails us. Might we at least maintain the pretense of keeping our ludic simulacra separate from the very real political stakes? We retain the means for correcting our situation through democratic self-governance, not distracting ourselves with a computer game (albeit, a fun and likely excellent one). Moreover, is there no freedom more essential than getting to replay one’s nostalgia unpolluted by the charlatanism of the pundits abetting teahadists’ zealotry, brinksmanship, and austerity?